I’ve come out of blogging semi-retirement to plug this story. Not that it needs much plugging mind. The Times is big as far as big newspapers go, and according to Wikipedia, one of the oldest. 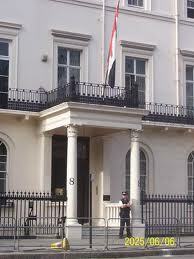 8 Belgrave Square: Syrian intelligence HQ in UK? The well-heeled residents of Belgrave Square will, I am sure, be aghast. And so they should be. Using diplomatic privilege to conduct a vicious campaign against dissidents is illegal and the Met Police and the Foreign Office should be having quiet words with Mr Samouri that unless he ceases his thuggish behaviour, he will be summarily kicked out of the UK. The protestors filming themselves and posting on youtube , very clear face images and smiling to the camera ? What the need to film from away?